Although there haven’t been any recent outbreaks of dengue fever … the threat of the Zika virus is still making the news. 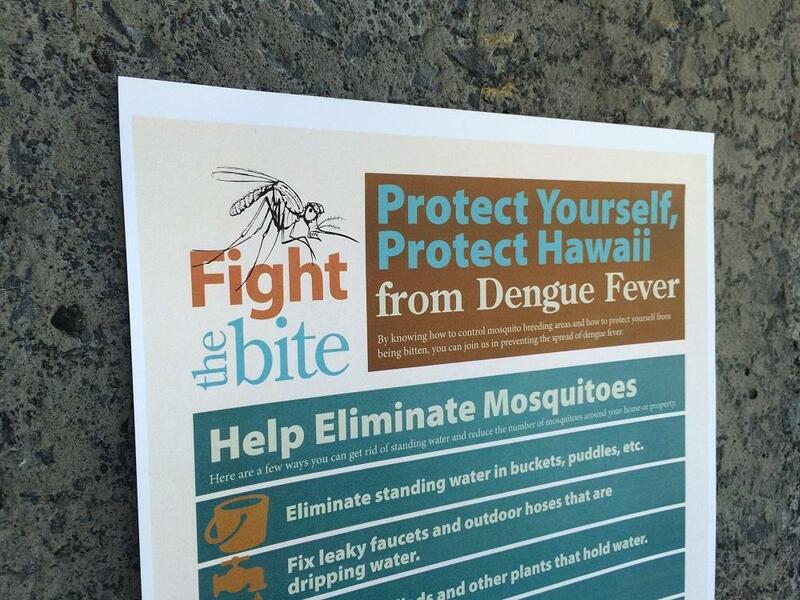 So the Hawai‘i State Department of Health is re-launching its “Fight the Bite” educational campaign about preventing mosquito borne disease. The department is putting up educational posters in airports, in busses, and will soon be running a series of ads on TV and radio. Officials are urging the public to take the same precautions that were taken for dengue fever. Anna Koethe is the Public Health Information Coordinator with the DOH. More information can be found at Fightthebitehawaii.com (and keep refreshing the page if it doesn't load the 1st time). Governor David Ige says the biggest outbreak of dengue fever ever recorded in Hawai‘i appears to be over. Ige says state officials still need to be vigilant about controlling mosquitoes….but he thanked lawmakers for restoring funding for positions to battle the outbreak. Hawai‘i Tourism Authority CEO George Szigeti said the today’s announcement is a vote of confidence for visitors to the state and to Hawai‘i Island. The outbreak of dengue fever started in September….and sickened a total of 264 people. The last case was reported on March 17th. It’s been 3 months since the Dengue Fever Outbreak was first reported on the Big Island. There are also concerns of it spreading to the neighboring islands. The Governor brought the County and State responders to the Capitol for an update. HPR’s Wayne Yoshioka reports. The number of cases of dengue fever on Hawaii Island continues to climb. Yesterday the Hawaii Department of Health confirmed 170 cases locally acquired since September. Until 2001, when it surfaced on Maui, the tropical disease hadn't been seen in Hawaii in more than 60 years. As HPR’s Molly Solomon reports, this could mean dengue fever is on the rise in the U.S. and around the world.